The site of the Kirk or chapel of Buccleuch is enclosed by a stone wall, and used as a sheepfold. Within the stell are still to be seen the outline of the old wall, with the 'Kirk yard dike'. 'The marks where houses seem to have stood are still visible on the burn side'. Buccleuch Church (Site), Only grass-grown wall-mounds now survive to mark the site of this church, which served the parish of Rankilburn until this was joined to the parish of Yarrow after the Reformation. The church was already ruinous by 1566.....21 October 1946." T Craig-Brown 1886; RCAHMS 1957. In the NE corner of the sheepfold at NT 3190 1200 is the outline of a rectangular building c.12.5m by c.8.0m, the probable remains of the church. Two sides are formed by the stone wall of the sheepfold, the other two by a low bank of turf c.0.2m high. South of this feature is a curving stretch of bank running from wall to wall of the fold. This bank is c.4.0m. 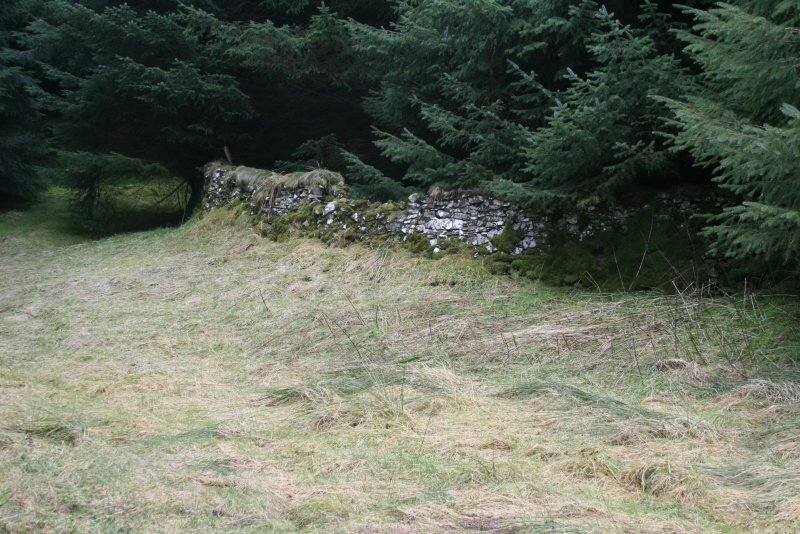 wide with a maximum height of c.0.4 m and may be part of the kirk dyke. Adjacent to the W side of the sheepfold are the turf footings of a rectangular building 7 x 3m, on its N side a rectangular enclosure, 14 x 7m, bounded by stone and turf banks, 0.9m maximum height. These may be the remains noted by the Ordnance Survey Name Book (ONB) - no other buildings were seen in the area. Visited by OS (WDJ), 11 July 1962. Visited by RCAHMS (SH), April 1985. 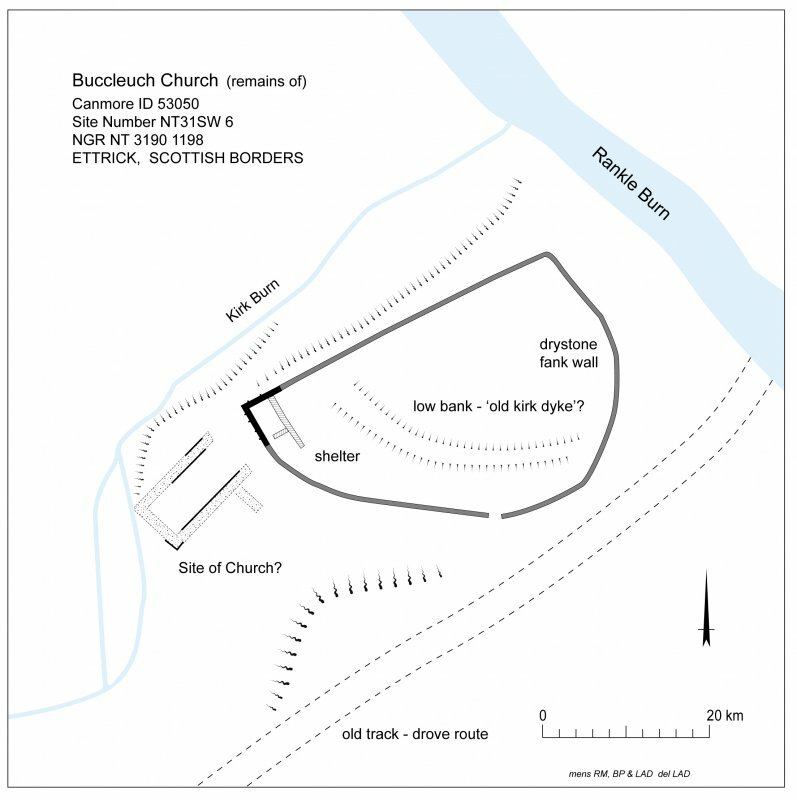 The assumed site of the former kirk or chapel of Buccleuch is situated on the W side of the remote Rankle Burn, a tributary of the Ettrick Water, immediately S of its confluence with Kirk Burn at a height of 280m. The site comprises the turf covered stone footings of a substantial rectangular building, which is believed to be the site of the kirk, a stone walled enclosure, likely to be a 19th century fank with a small roofed building constructed in one corner, and a curving length of earthen bank which is enclosed by the wall of the fank. The entire site is over planted with mature commercial coniferous forestry. The low footings of the larger building assumed to be the church are aligned NW-SE and measure some10.20m x 4.6m externally although the footings at the E end of the building has been robbed away, probably in order to construct the small rectangular building adjacent within the corner of the fank. A wall width of around 0.9m was recorded between internal and external wall faces with larger quoins visible at the SE corner and a short spur of stony bank perpendicular to the wall line on the S side could be interpreted as evidence of another compartment to the building. No potential entrances were determined. It is probable that much of the stone used for the construction of the fank wall was taken from the earlier building, and some dressed stone within the fank wall would seem to attest to this. The ‘D’ shape fank encloses an area of some 1000sq m with a straight edge along the entire N side that has slumped in places due to being undercut by the burn, and the remainder of the curving circuit appears to have been constructed segmentally. There is a single entrance into the fank mid way along the S side adjacent the course of former drove road. From their appearance the fank walls are assumed to be of a single phase of construction and do not appear to overlie any earlier footings. They are generally in good repair and stand to an average 1.2m high under a turf capping. 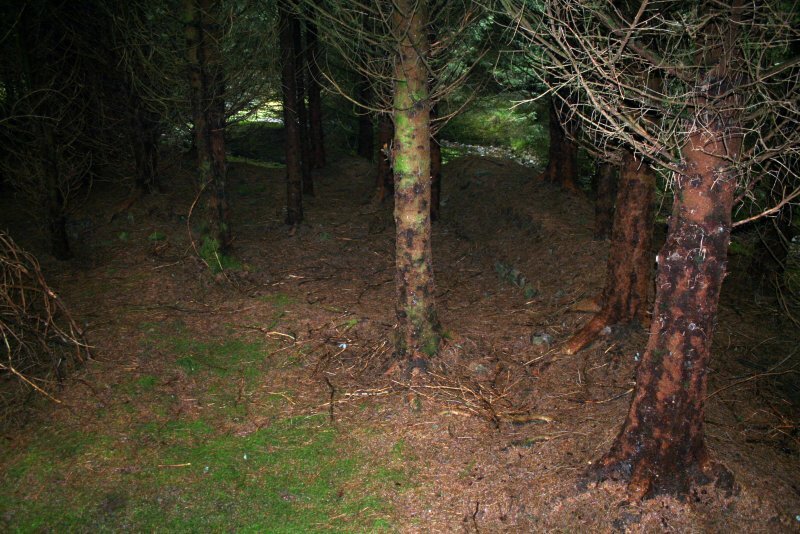 The interior of the fank is uneven; gently sloping ground is either covered in moss or spruce needles with emergent tree roots from the plantation breaking the surface. 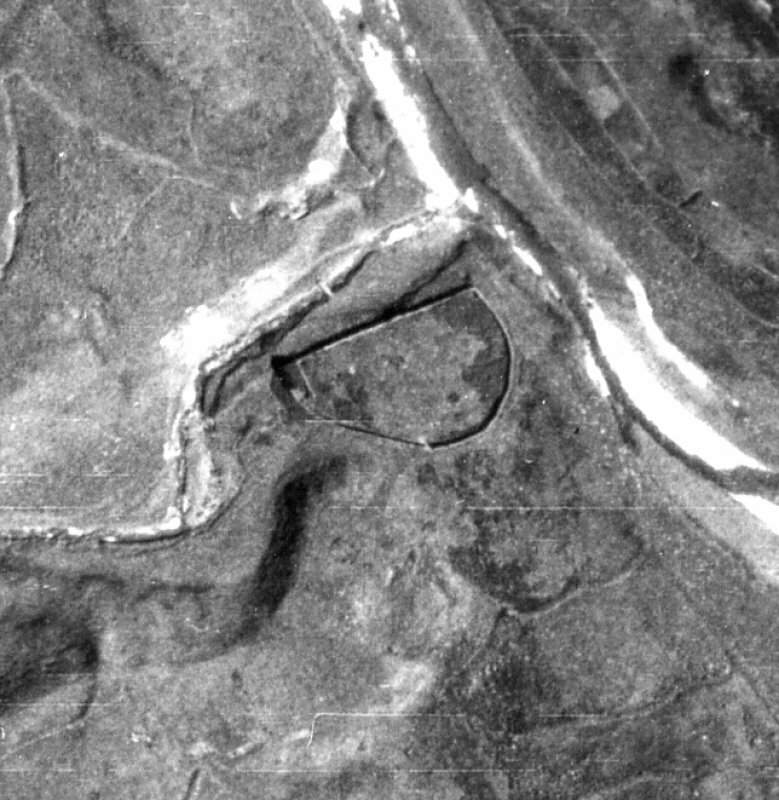 Within this area can be discerned a low, broad curving section of bank some 30m long which approximates the line of the fank walls to W and S. The bank has been previously described as a part of the ‘kirk yard dike’ but it does not appear to have continued outside the boundary of the stell. The location of a building (the kirk) described as being within and incorporated into the NE corner of the stell was not apparent. There is however a small rectangular building some 4m x 3m that has been either incorporated into or most likely built subsequently within the W corner of the stell. Although mortar bonded in places and with quoins at the NW angle the walls not substantial, being the same width and standing to the same height as rest of the stell. Stones protrude at intervals from the wall faces on the N and W sides; these may have served as ‘thack stanes’ or simply be a decorative feature of a later rebuild. 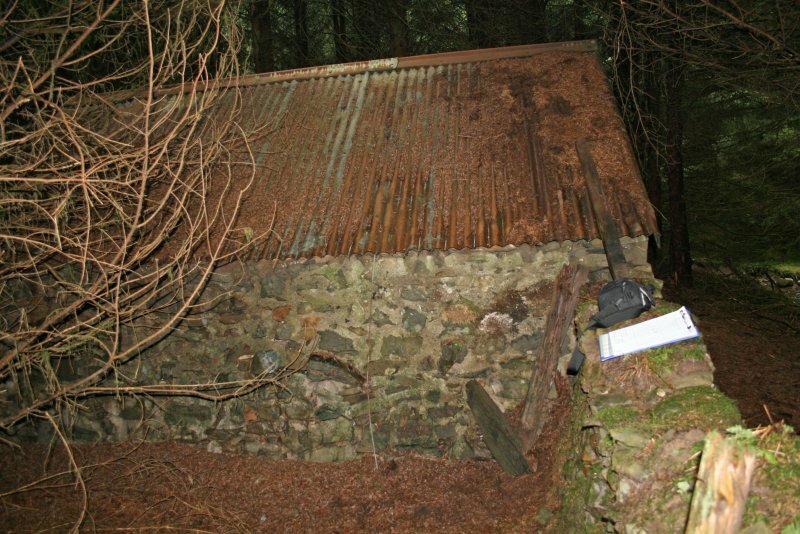 The structure is presently roofed with corrugated iron over a simple ‘A’ frame roof with wooden board gable ends above the wall head. There is an entrance on the inner S side. 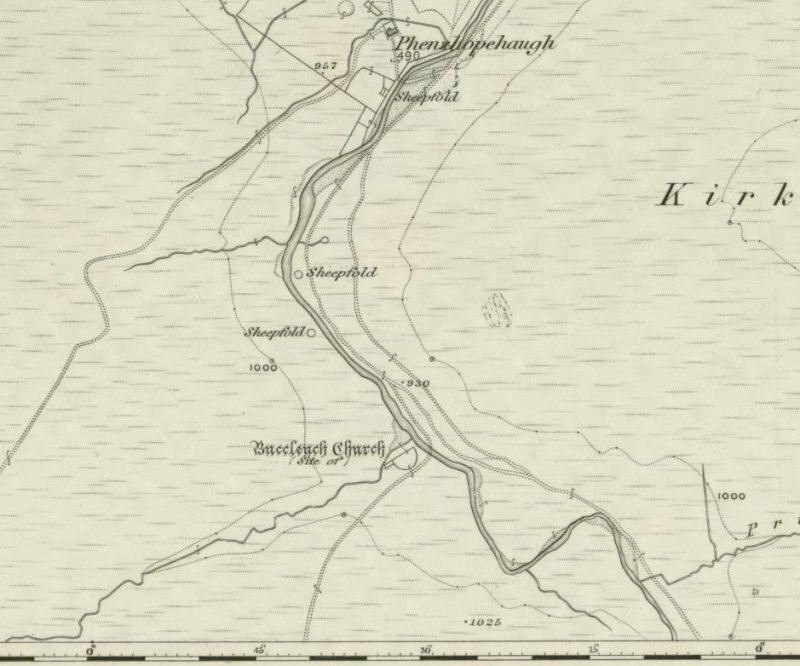 A single un-roofed rectangular building and enclosure are depicted at this location on the 1st edition Ordnance Survey of 1858 (Selkirkshire, Sheet XVIII). The enclosure and the building are also depicted, albeit less convincingly on the modern map. The N walls of both the larger building (possible church) wall and the fank are depicted as being aligned on the various editions of the OS maps but in reality they are not, which may be further evidence that the construction of the small building within the fank is a later feature not related to any earlier structure. It is now difficult to reconcile the visible building remains with that of a church, and the alignment of the long axis is in itself ambiguous. It is possible that the bank enclosed by the stell wall is the remnant of an earlier enclosure of which nothing else now remains. In any event it seems quite divorced from the building remains on the W side of the site. The location of the fank adjacent to the drove route and the fording point is significant; it is possible that the enclosure is as likely to be related to cattle droving as to sheep husbandry. The small building may have been a shepherds or drovers shelter. The parish of Buccleuch (or Rankilburn) and the church were in existence at least as early as 1415 (Origines Parochiales Scotia) but the church was probably abandoned after the principal family within the valley- the Scotts of Buccleuch forewent Buccleuch Tower as their residence in the mid 15th century. The church was replaced in use by New Ettrick Church in or shortly after 1446 becoming the parish church of Ettrick and Buccleuch from about 1650. David Scott of Buccleuch who died in 1491 was buried in the family burial ground at Peebles although the next nine lairds were reputedly buried in the Buccleuch church. A further visit to the area is recorded in 1801 by Hogg, the Ettrick Shepherd with Sir Walter Scott.
' We found no remains of either tower of fortalice, save an old chapel and churchyard ... There was a tradition in the county that a font stone of blue marble, out of which the ancient heirs of Buccleuch were baptised , lay covered up among the ruins of the church. Mr Scott was curious to see if we could discover it; but on going among the ruins we found the rubbish at the spot where the altar was known to have been dug out to the foundations, we know not by whom, but no font had been found. As there appeared to have been a kind of recess in the eastern gable, we fell a-turning over some loose stones, to see if the font was not concealed there, when we came to one half of a small pot, encrusted thick with rust.' This turned out to be a 'tar pat'.! It would appear that nothing more was discovered.